This was a hike into Flowed Lands from Upper Works to check on our adopted lean-to, Herbert Brook. The weather was questionable with scattered showers in the forecast, but Leesa and I weren't going above treeline so we weren't too concerned. The Calamity Brook Trail was wet and muddy, but we just took our time managed to get through it OK. On this day, we took 2 hours to reach Flowed Lands. It takes 1.5 hours when we are moving fast. I like the Calamity Brook Trail, in spite of it's mud. It also has a fair amount of rocks to negotiate on the trail, but I like the variety of woods. In the winter, it is without a doubt, one of my favorite ski trails. On the hike in, I was telling Leesa that it is kind of fun getting caught in a rainstorm while you are at a lean-to. As luck would have it, that is exactly what happened. We arrived at the lean-to and looked things over and just as we were sitting down to have lunch, the sky opened up. It only rained for about 10 minutes, but it was enough to bring the bugs out. As soon as the rain stopped, the black flies found us at the lean-to. It was enough to get us headed back. 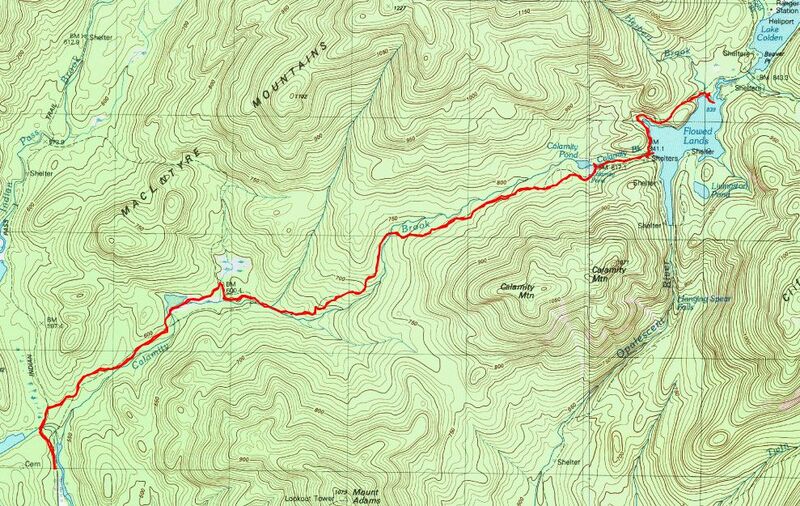 The route from Upper Works to the Herbert Brook lean-to and back is about 11 miles round trip. It takes us anywhere from 4 to 5.5 hours to do the trip depending on how fast we're moving. 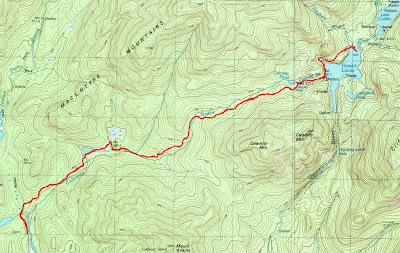 Flowed Lands, Lake Colden and Avalanche Pass are nice areas to explore. Not every trip has to hit a summit.